A.A. Milne and Z.Z. Top are not just at the opposite ends of the 20th century’s cultural and chronological spectrum, they are also polar examples of another kind. I mean, of course, in the alphabetical use of two initials as a form of nomenclature, which, as a device, often makes for a memorable moniker. Oscar Wilde, in his time, knew a few characters thus named, including two of the most celebrated: W. B. Yeats and H. G. Wells. However, on this day I should like to focus on two similarly styled, but lesser known, artists in the Wilde story, for they share a bond more profound than the form of their familiar names: I refer to F. D. Millet and W.T. Stead. 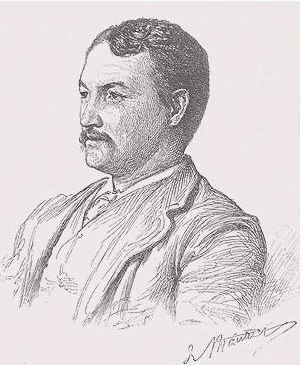 F. D. Millet, portrait by George Du Maurier, 1889. Francis Davis Millet was an American painter, sculptor, and writer with whom Wilde became acquainted quite early on in his American lecture tour of 1882. On January 11 that year Millet was invited to a reception given for Wilde at the Dress Association on W. 23rd St., hosted by the proprietor of that cooperative enterprise, the journalist and actress, Kate Field. Also present were the actress Clara Morris, E.C. Stedman, and other artists and painters including Elihu Vedder.